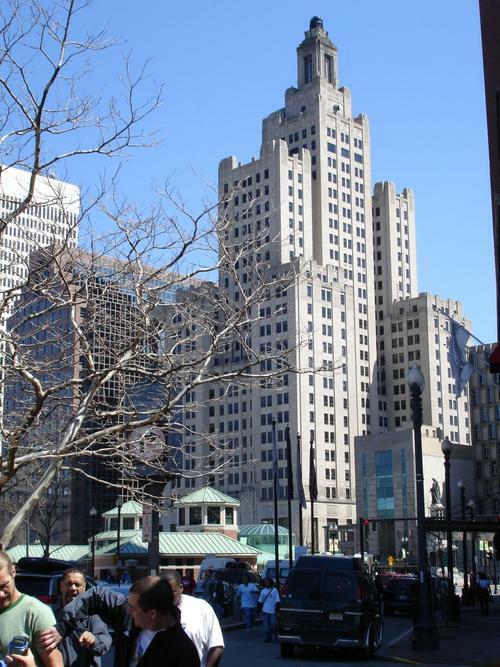 The Bank of America Building () is the tallest building in the city of Providence and the state of Rhode Island, and the 28th tallest in New England. Standing at 428 feet (130 m) and comprising 26 floors, it was the third tallest building in New England when completed, behind the Travelers Tower in Hartford, CT and the Custom House Tower in Boston.. The building was built as the Industrial Trust Tower in 1927, and designed in the Art Deco style popular at the time. 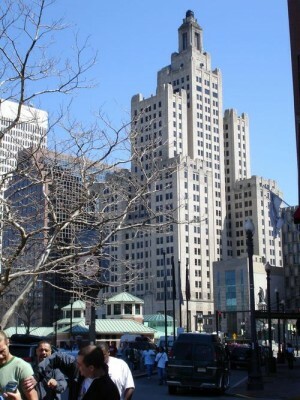 Though stepped buildings in New York City had been architects' solution for Manhattan's strict zoning regarding adequate light and air, facing no such restrictions in Providence, the New York architects, Walker & Gillette, chose to keep symmetrical stepped massing. The base and the trim at the base's top was built to match the cornice height of existing adjacent (now gone) four-story buildings. The building has remained relatively unchanged over the years with the exception of the lobby, the upper windows and several stone eagles at the top of the tower on the light beacon, which were removed decades ago after an eagle fell to the street below.